Real Madrid have opened talks with Declan Rice’s family over a potential swoop, according to Sky Sports journalist Scott Minto. The England midfielder, a firm favourite of the fans in east London, put in another fine display against Manchester United on Saturday evening, and covering that match, Minto claimed that he had heard big things about who was interest in the youngster. 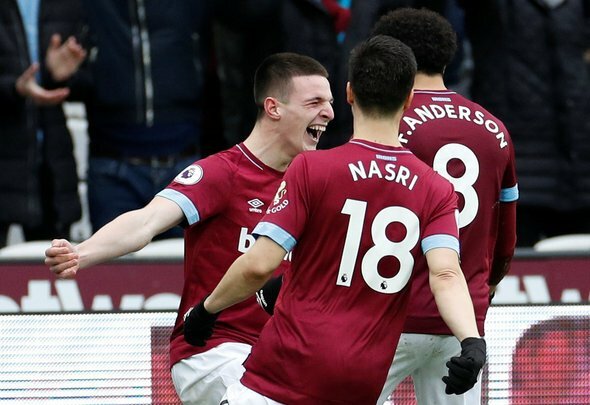 Speaking to Malaysian network Stadium Astro, former Hammers defender Minto and lead host for Sky Sports’ Football League coverage said: “He’s physical, he’s quick, his maturity for his age is incredible and he’s getting better and better and better with every game. This is a huge, huge claim from Minto, and one that he seems to be taking pretty seriously. He hasn’t named his source, but if you’re going to go out on a limb and make such a whopping claim, there surely has to be some grain of truth in the matter, at least from his end. It stands as testament to the meteoric rise that Rice has had that this kind of rumour, as tall as it may seem, isn’t simply laughed out of the place, and you would have to say that if he continues on the trajectory he is on, progressing at the rate that he is, then he could be good enough for a European supergiant somewhere down the line. For now, however, is he going to up sticks and move to Spain? You would be absolutely amazed if the answer was yes. West Ham won’t want him to leave at all, but if he does go, an English side seems much more plausible.